5 Irresistible reasons to visit Jamaica during your next accessible vacation! Jamaica is an ideal Caribbean vacation spot, even for disabled and senior clients! The size of the island makes it possible to experience the coast, mountains, and Jamaican culture all in a single day! You can easily visit historical plantations and swim with dolphins, before ending your day relaxing on the beach while enjoying some traditional exotic Jamaican cuisine. You’re probably ready to go already…but just in case you’re not fully convinced yet, here are..
1. The people – Hospitality is a big part of Jamaican culture. From the moment you leave your cruise ship or airplane, you’ll be met by friendly, warm, local Jamaican people eager to help you and provide you with the best Caribbean vacation possible. 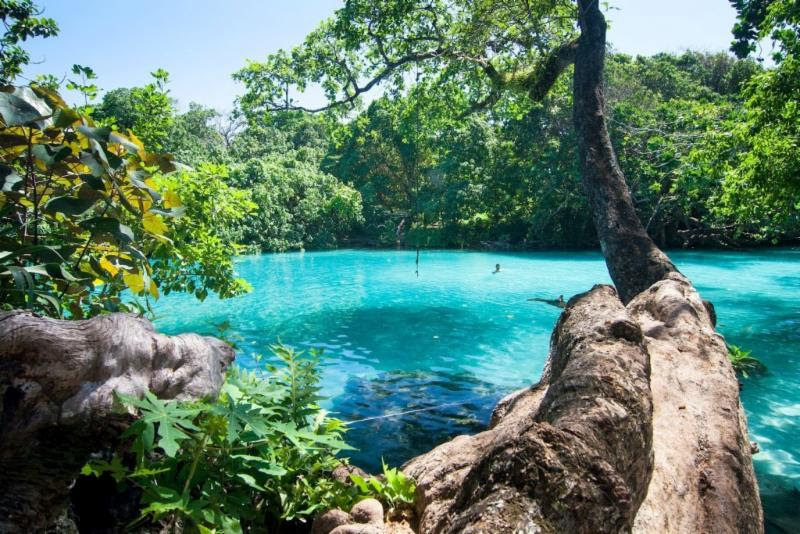 To truly experience Jamaican warmth and hospitality, you should definitely consider taking a private tour led by a friendly local tour guide.“Seeing” Jamaica is not the same as “experiencing” it. 2. The food – Fresh. Fresh. Fresh! Fresh seafood and meats directly from the local fishermen and farmers, and colorful markets overflowing with freshly picked tropical fruits and vegetables. Whether you are in Jamaica for a day or a week, make sure to get a taste of authentic island style food by visiting smaller local restaurants instead of the touristy all-inclusive resort style buffets. Besides from exotic dishes and drinks such as ackee, mango salads, crème de coconut and rum punch, you’ll have to try some jerk-seasoned dishes… The jerk flavor in Jamaica is unlike any other place in the Caribbean! 3. Accessible experiences – While Jamaica disabled access presents some of the biggest challenges among the Caribbean Islands I’ve visited, including mountains, hills, steep ramps and rough terrain, there are still several accessible Jamaica shore excursion options that makes Jamaica a memorable destination for disabled and senior clients. Visit Columbus Park, Dunn River Falls, Coyoba Gardens and Fern Gully. Travel back in time at the Good Hope Plantation Home, or try out something more adventurous such as accessible river rafting! 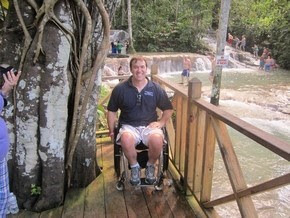 When you book your accessible Jamaica shore excursions through ACV, you’re in good hands! Our knowledgeable, professional, friendly local tour guides are excited to welcome you their island! 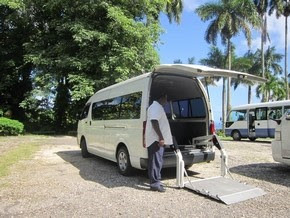 Our services include transfers and tours from the cruise terminal in an air-conditioned, accessible van with a wheelchair ramp so you won’t have to worry about accessibility details and can spend more time enjoying your accessible Jamaica experiences. 4. The beaches – When you think about the Caribbean, what is the first picture that comes to mind? The likelihood of it being a beautiful exotic beach with palm trees and crystal blue waters is high. In Jamaica that is exactly what you get! The beautiful clean, white sandy beaches stand in breathtaking contract to the crystal blue water and lush green vegetation. The beach areas in Jamaica are some of the most beautiful ones in the entire Caribbean! 5. The Weather – With an average temperature of 81 degrees in Jamaica year round, can you think of a better vacation paradise? The days are warm, the nights are cool, and the rain, if any, usually falls for short periods in the late afternoon, with sunshine the rest of the day. We offer Jamaica shore excursions in both Falmouth, Ochos Rios and Montego Bay, and if you book your accessible cruise + excursions package with Accessible Caribbean Vacations you receive a $50 off discount on your excursion! Start planning your accessible Jamaican vacation today!